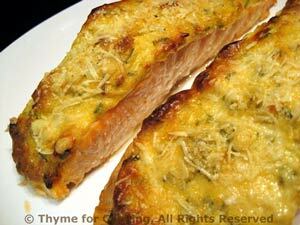 Baked Salmon Dijon, Thyme for Cooking easy gourmet dinner. The salmon is baked and the polenta and broccoli finished are in the oven. 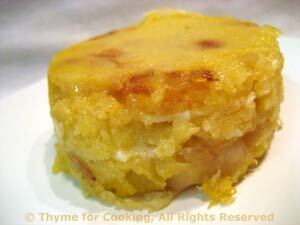 This is based on the very popular British comfort food 'Cauliflower Cheese', but a bit lighter. Like some other cruciferous vegetables (Brussels Sprouts) broccoli is best if not overcooked. Put on medium heat and steam for 10 minutes or just until barely tender. Remove from pan and keep warm. Add flour and cook, stirring with a whisk or fork. Slowly add milk, stirring constantly until you have a thick sauce. Stir in cheese and heat until just melted. Pour over broccoli and serve immediately. Or arrange broccoli in an oven-proof casserole or serving dish. 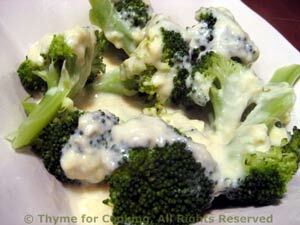 Pour cheese sauce evenly over top and place in a warm oven for 10 - 15 minutes. (250F, 125C).